Post-Traumatic Stress Disorder (PTSD) has been in the news frequently over the last few years, with stories typically surrounding the need to treat military personnel. PTSD can affect anyone who has suffered a traumatic event, however, and first responders see more trauma than the average person. After large traumatic events, many agencies bring in psychological help for responders, and conduct a Critical Incident Stress Debriefing. In the larger departments, a psychologist, chaplain, or other mental health resource may be available onsite. PTSD is not prevented by these stress debriefings (1), and acute mental health care, while critically important, cannot address the long- term crisis of untreated PTSD on the responder, the community, and the family. Confidential treatment is available, but PTSD must first be recognized as the issue, and the culture of the agency must encourage responders seek help. PTSD cannot be cured by well-meaning “pull yourself up” and “we were all sad” discussions. The symptoms may first emerge months or years after the traumatic event, and symptomatic behaviors may accumulate slowly over time. Treatment of individual symptoms may mean that PTSD is missed by providers, and if not recognized as the underlying cause of the problem, it cannot be properly treated. PTSD can act as the silent partner for a long time before the untreated responder spirals out of control. Substance abuse is often a symptom of underlying PTSD. Suicide can be the tragic result of untreated PTSD. Mark Lamplugh Jr., the founder of 1st Responder Treatment, understands the unique needs of treating first responders. Starting as a fire explorer at 15, he served in the fire service for 12 years, achieving the rank of Captain. He hails from a family of Firefighters and Police Officers, and was raised at the station. • LEO: Many Law Enforcement officials are hesitant to come forward with their problem for fear of losing their jobs. The rate of suicide is somewhere between 5 to 10 times more than LODDs. • Firefighters: Firefighter substance abuse and alcoholism is a major problem in the fire service, with around 33% of the fire service suffering from some form of PTSD. Approximately 52% of PTSD sufferers will go on to have a substance abuse problem, leaving some 18% of all firefighters with some sort of addiction. • EMS: Easy access to a variety of medications can lead EMS providers to fall into the downward spiral of abuse and addiction. These signs of a problem should not be ignored. Many responders fear coming forward with a problem because the personal identity of the responder is tied so closely to the job. The fear of losing the job can be greater than the fear of losing their family. Volunteers who serve may be at risk; after an eight-hour fire with a fatality, they may return to the station, shower, and go to a regular job. Small and mid-sized agency personnel may feel their standing in the community would be threatened with an admission of a problem. Turning a blind eye, giving an additional day off, or rearranging shifts will NOT cure the member with PTSD, and may add to the feelings of guilt. The only course of action is to encourage treatment for PTSD. When should a responder seek help? Actually, many do, but not for PTSD. Mark explains, “1-2 years after an incident a responder sees the physician for a sleep problem, and is given medication for that. They seek help for ‘anxiety’ and they receive a prescription for Xanax or Ativan, a benzodiazepine. Then the muscle aches start. Or they have a few beers to help them get to sleep at night.” Without realizing the underlying cause is PTSD, the responder is at risk for addiction. The family members or colleagues of a responder needing treatment may first reach out for help. Confidential help is available, and self-reporting to a resource can save the responder and the career. In fact, self-reporting and calling for assistance BEFORE a crime or other issue occurs is critical for protecting the job. If a responder calls after a DUI, or after drug use is caught on the job, the call may not protect the career of the responder. While treatment for PTSD will help the responder, once treated, the mess left behind at work will still need to be addressed. Considerations as to the type of treatment required must be determined by the resource contact. According to Mark, not all first responders need an inpatient type of treatment. "Referrals to outpatient therapy and other programs is a large part of what we do.” The goal of 1st Responder Treatment is to get treatment for responders and get them back on the job. For those responders who do require an inpatient treatment, private and confidential programs are available. In the last twelve months, 1st Responder Treatment has treated over 100 responders at the Transformations Treatment Center in Florida, which treats the co-occurrence of substance abuse and PTSD. If the responder is unable to attend there, the organization will place responders with the best treatment options available. Providing the information proving that their career will be protected may encourage a responder to seek treatment. The Family Medical Leave Act (FMLA) and the Americans with Disabilities Act (ADA) can protect the job of someone who is suffering from PTSD while they seek treatment. The FMLA “provides certain employees with up to 12 workweeks of unpaid, job-protected leave a year, and requires group health benefits to be maintained during the leave as if employees continued to work instead of taking leave.” The ADA is a civil right protection available to those diagnosed with PTSD. Job protection and reasonable accommodations for work are some of the results of this legislation. See the ADA Frequently Asked Questions for more information. A wonderful resource on the legal rights under FMLA and the ADA as well as a family support resource can be found here. In many cases, the agency or department can have the positive impact on influencing a member to seek help for PTSD. As Mark tells us, “I wouldn’t have listened to my wife or my family. But, if the guys on shift, the guys I rode an engine with day in and day out, would have sat me down and said, 'Here’s a card. Go get help or don’t come back. You’re a great Firefighter, but you have a problem and it can’t continue,' then I would have listened to them.” The job requires that responders take care of the community, the brotherhood, everyone else but themselves. Approaching a member of your agency in a non-confrontational way, with support and resources, is the first step. Providing consequences is the second. Those consequences may include “running it up to the top,” NOT as a threat to a career, but a demonstration that the member’s PTSD has been recognized and must be treated. As discussed above, confidential treatment is available, and should be encouraged. Unfortunately, information on available resources is not always readily available. Look around your agency this month. Make a list of the resources available on PTSD. Books? Literature? Bulletin Board parts? When was the last discussion on the responder and PTSD? We have resources available. 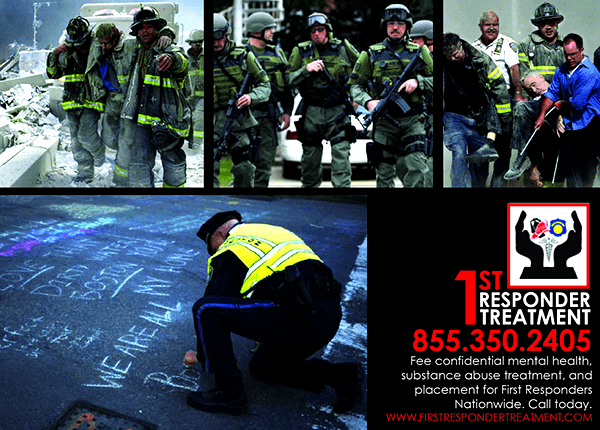 First, Email Mark with your address to receive Bulletin Board parts for your agency mark@1strespondertreatment.com. 1st Responder Treatment has teamed up with Chasing4Life to bring courses on Psychological First Aid. The two-hour Awareness class teaches management of responder stress and the recognition of PTSD. Visit Chasing4Life's webpage for more information. Make a commitment this month to learn the signs that a responder may be suffering from PTSD and have a discussion about how the agency will assist in the treatment of those who need it.